Submitted by lynn on Tuesday, February 23, 2016 - 6:19pm. 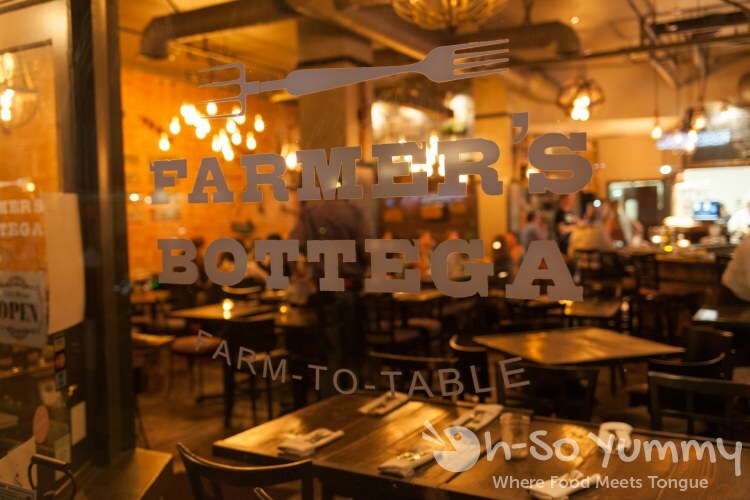 One of my top choices for this year's San Diego Restaurant Week was Farmer's Bottega. And... it's also my 200th review! I wrote over half of those within the last two years! Wow does time fly by before you know it! At 7:30pm on a Sunday, the restaurant was packed and we were seated in the back patio area. Even though it was chillier outside, the heat lamps were at a perfect temperature that Dennis, wearing his big coat, was neither hot nor cold, and myself, in a sweater, felt quite cozy. It was also quieter and less cramped in the patio so we were quite happy with the placement. I heard good things about this salad from Baby Birds Farms so made sure to order it. The sliced carrots still had a slight firmness in their bite. I love roasted everything and additional caramelization/burnt-ness in conjunction with creamy avocado, microgreens and sharp red onions would have blown my mind. Dennis thought it needed more variety though. 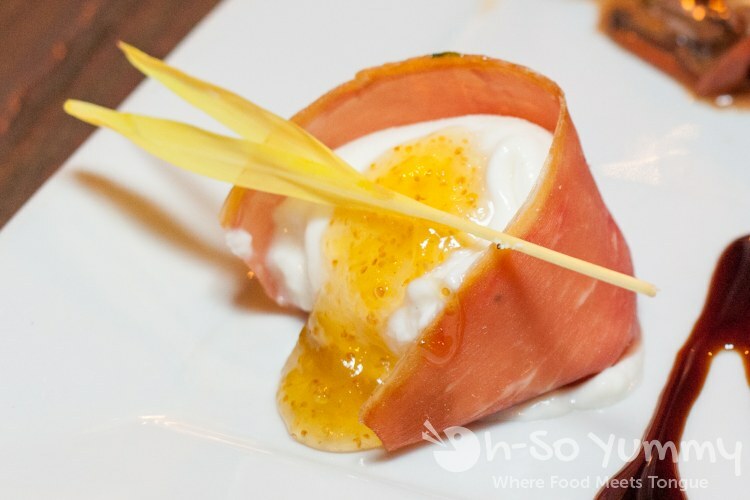 This delicious soft burrata wrapped in prosciutto was a fun pow-wow in my mouth. Dennis said it reminded him of yogurt with a sweet jam treat. The dark sauce was on the acidic side and could overpowered the cheese if you dipped it. We thought some bruschetta style bread would have been a nice accompaniment to the cheese. The app did come with a side of artichoke marinaded in vinegar and carried the typical oiliness I'd find straight out of a jar. The entree plates were super huge, like a kid's skateboard! The chicken stayed super moist, surrounded with slightly fatty and oily juices. It was a delicious mess. Underneath were some soft brussels with little bits of char and roasted skinned potatoes. 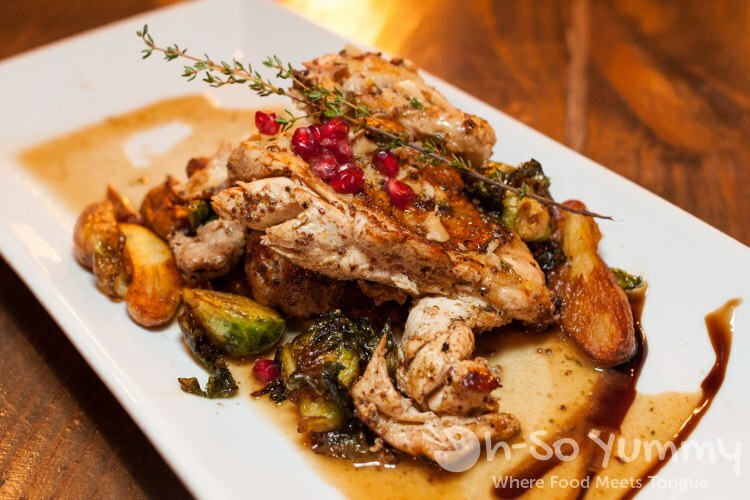 Perhaps not so roasted because the chicken juice was softening everything around it! 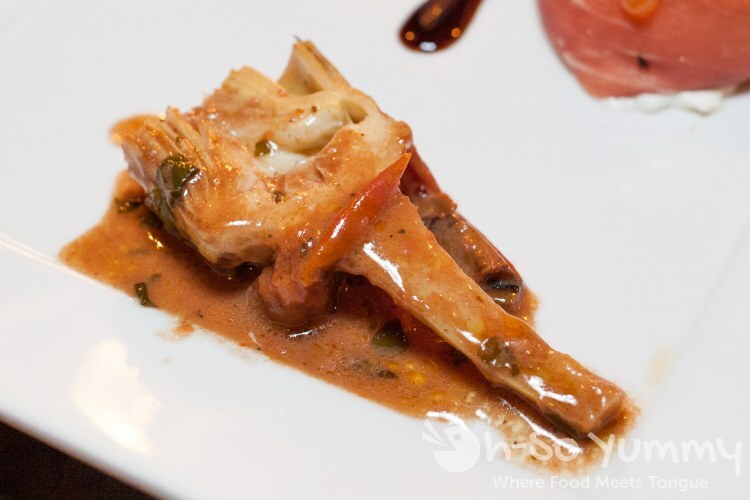 The portions were plentiful for this dish! 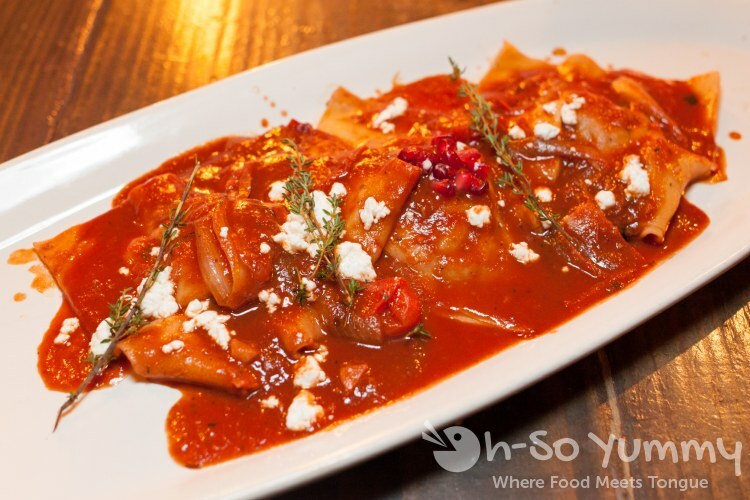 The oxtail ravioli had a savory sauce with a nice deeper flavor to it. The consistancy was thicker and coated the pasta well. The bits of goat cheese went incredibly well with the tomato sauce. One platter contained three huge raviolis, but the extra flat noodle edges kept pulling the rest of the ravioli off my fork! Gimme more of the good stuffing please! Of course, we had to end with desserts! 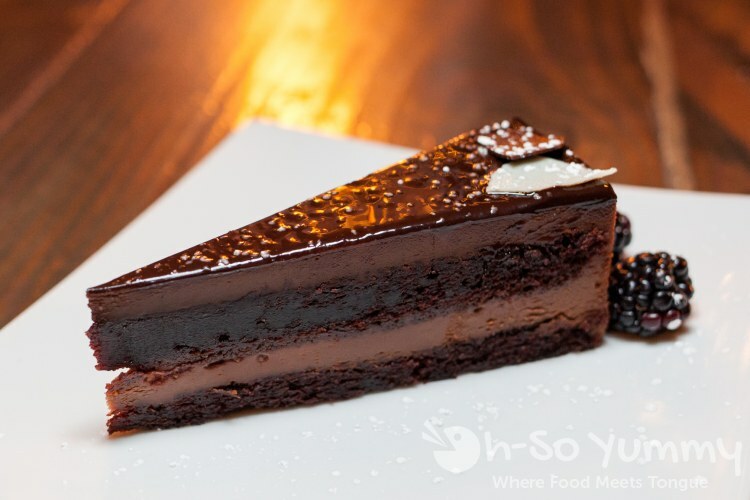 This lovely and tasty cake was indeed chocolately smooth but there was a part of the flavor that threw us in a loop. We pondered this until it suddenly hit Dennis - matcha green tea! Go figure since it's not in the ingredients list! This dessert was delicious but unexpected in taste. 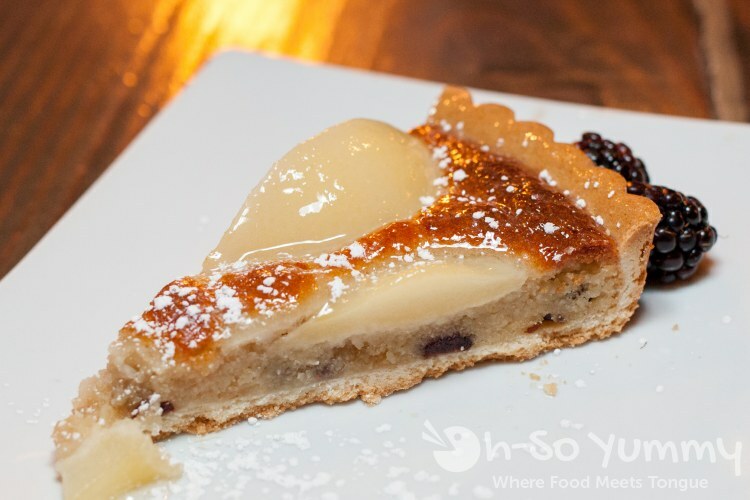 Rather than a fruity pear or cranberry taste, it had a strong almond/amaretto taste! The SDRW menu is attached at the bottom and we definitely enjoyed our pre-fixe meal here. Neither entree had complex flavors but were created from simpler concepts, basically a menu full of comfort food meals done well. The food portions were plenty to get you full without feeling heavy. It's just a small thing but I always appreciate when the restaurant lighting enables you read the menu easily (Banker's Hill was delicious but super dark). Our server was kind and took good care of us. What a great last meal to end SDRW. Until the next one! This place had been on our list of a long time - we're very close to that 'hood and have slowly been working our way around the block. We won't skip those carrots - or the chicken!! I have been working this block too! Still need to try The Patio and Lefty's! Congrats on review #200! That chicken sure looks juicy! 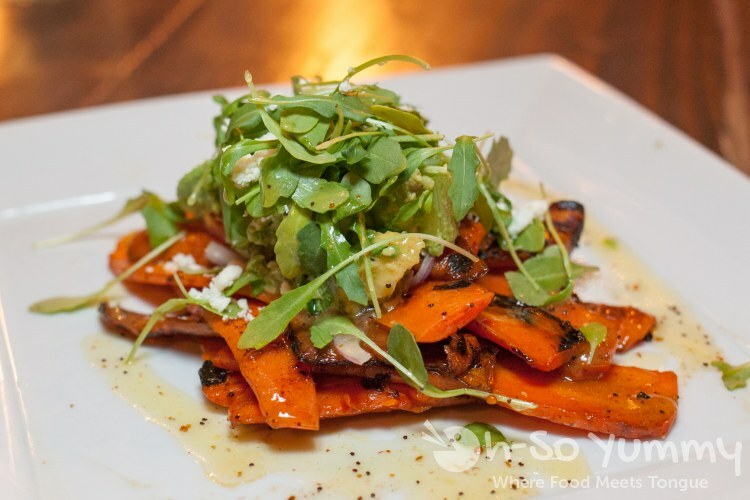 That burrata looks delicious - I really want to try out this restaurant now :) Congrats on the 200th review and keep informing the SD food loving masses with fantastic reviews! I've wanted to visit this restaurant! The restaurant name sounded so romantic for some reason. "A delicious mess" - loves! The chicken dish looks a bit chaotic but glad it tasted nice. That pasta looks so dreamy. I didn't try out RW this time around but looking forward to burger week soon..
omg i can't wait for burger week BUT i'm dreading the food belly effects... gotta up my workouts!